Here’s the deal. I’ve never run this race before and am not familiar with the starting/staging area for the race. But the folks affiliated with the Running of the Ears website (www.runningoftheears.com) have run the race. So since I want to meet some of those great people, and I want to meet those listeners who are racing. I have decided to piggy back on their meet up location. 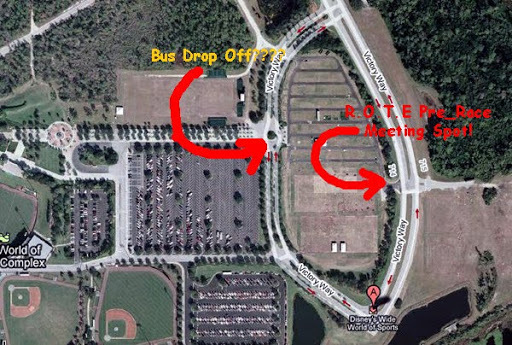 Someone on the ROTE forums posted a satellite photo and marked it for the meetup. I’ll be at the race location at least 45 minutes prior to start and will get to this location as soon as I can so I can have a long time to meet those of you who will be there. I will be the guy wearing red shorts, a black Brooks ID shirt, and possibly a white hat or visor.